South Gloucestershire’s Time 4 Reading campaign launched yesterday on World Book Day (Thursday 5 March), with a day of book swapping and making time to appreciate the enjoyment of reading. South Gloucestershire Council challenged everyone in the area to take five minutes out of their day to read and to recommend a book to a friend, family member or colleague. We know that the best way to promote reading is when someone recommends a book to us, so Time 4 Reading was created as a fun way to encourage more people in South Gloucestershire to read. The Time 4 Reading campaign will feature a year of events across South Gloucestershire which aim to get everyone reading from preschool children to older adults. The project will provide a range of exciting activities, programmes and partnerships designed to improve literacy. 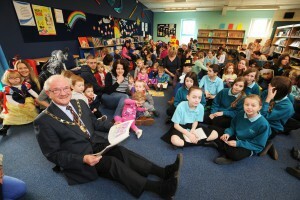 The launch event at Bradley Stoke Library saw Chairman of South Gloucestershire Council Cllr Howard Gawler join pupils from Bradley Stoke Community School, local people and library users of all ages to enjoy a special reading session. Award winning author Nathan Filer, winner of the prestigious Costa Book Award, is supporting South Gloucestershire Council’s campaign to get everyone reading. He said: “As a child reading didn’t come easily to me, and this turned me away from books for a long time. Today my shelves are full and books are a huge part of my life. I find something a bit miraculous about them – these perfectly portable, no-batteries-required objects that we can pick up for free in our local library, and that might just change the way we think about something forever.